... on my recent works! I'm totally doing this for the #showyourheart badge I get if I complete all the daily prompts, but hey, is that a bad thing? You all deserve a good hug for supporting me, so these prompts are a perfect excuse to do another feature! And I totally wanted to include princeofallsofas too, but you don't have any deviations. In keeping up with the tradition, a list of memorable things happening last year! 2018 was also the year I started seriously trying to sell prints and merchandise. I did my first two conventions, and both were extremely fun! I already have plans to attend the largest Dutch convention in March, excited how that'll turn out! Back to living on my own! I became good friends with the girl that lived in the space before me, she goes to the same art school as me and we discovered we have quite some mutual friends. She introduced me to a local draw club and lots of other people too. Human characters! For a long time I felt very uncomfortable drawing them, but I feel I have reached a point that I can draw a person and think, yeah, that looks like an anatomically correct human being XD Due playing pen & paper RPG's I also made up human characters, I never really did before. Started working on my graduation project in September, which revolves around the mythological harpy and character design. If everything goes well, I'm done with school by February! I'm really excited and a little scared at the same time, as I won't be able to call myself a student anymore, I'll be part of the workforce! I joined my first Original Character Tournament! Though, can I really say I joined when it has not started yet? The deadline for auditions has been extended twice and I'm still far from finishing my audition comic. I greatly underestimated the time it takes to make a comic, and with graduating and other projects I kept procastinating on it. Though as a spectator, my deadline is not the same as for competitors, so I aim for the end of Round 1 instead of January 13th. Did Inktober every other day, and it was much more relaxed that way. Best way to be part of the challenge without taking too much work on my plate! In the same light, I thought I had posted little in 2017, but I posted even much less art in 2018: only 65 deviations. My internship and part-time job took a lot of energy away from drawing for myself, I guess. But there's no use in saying "I will do more next year' as I keep saying that every year and I actualy post less every year. I better say, let's hope I can get to 65 deviations next year. Apart from uploading art, I've also written 11 (+ 1) journals this year. (actually twelve but I don't count last year's retrospective which I should have uploaded in 2017 anyway ) And my watcher count has grown to 481! What kind of great things happened to you in 2018? Luckily, I found a way to deal with this! Normally fourth year students start on their graduation project in February and finish around the end of June. Then there is a degree show in the first week of July and the school closes for the summer. I decided last year I didn't want to graduate yet and do an internship instead (best decision ever), and start graduating in September. There are many cons to this: you still have to pay tuition for a full academic year, teachers have less time for you and you have a few weeks less time in general. There is no degree show in February, but you have the opportunity to join in July. Fortunately, there are pros too, and one of them is that you actually have time promoting and preparing your degree show! Instead of stressing until the end of June about making the deadline and putting all ends together, I will have time to plan this thing months ahead! So this is the plan: I am gonna share visual progress, sketches and finished drawings, and photos of the finished project when it's done. From February onwards, I will write a series of blogposts about the more theoretical part of my project, the why's and how's basically. It's a bit like the postmortem articles about game design found on Gamasutra: reflecting on the progress of creating something while the project is already round up. But, let's end this blog on a happy note! There's the new gameplay trailer of Godhood, the game I worked on during my internship! It was published a few days ago already but I'm terrible with keeping up with those things XD I'm glad to see my trees are still in the game, as well as the shrine I worked on at 0:16-0:25! I made the leopard statue at 0:48 in the battle too! On 28 October 1918 Czechoslovakia declared independence from the Austro-Hungarian Empire, today exactly 100 years ago. And it also happens to be my birthday! Thanks everyone for the nice wishes! A birthday I spend mostly working like a dog, though. >< I work in a self-service restaurant and due autumn break and the bad weather it was super busy.. Glad that is over! A little more patience, my friends! Long time since I wrote a journal! I thought it would be nice to tell about the things I'm working on and so. At school I'm working on my graduation project, which consists of a research paper and a 'practical' art project. For my research paper I'm researching the harpy and what this mythological creature can mean to us nowadays, perhaps as a symbol. Yes, more harpies! I wasn't sure if this subject would be a good fit at first, but seeing how this creature has nestled in my mind for the last year, I know it won't be something I get bored of quickly. About the practical part, I haven't got a clue what kind of product this will lead to. I'd love to make a bunch of harpy characters and tell a story, either through a comic or illustrations, but it has of course to build upon the research paper. And you can't really say anything about a harpy without saying something about the fact that all harpies are female, right? Do I want to make a feminist statement? I'm not sure.. The deadline for auditions is November 1st by the way, and we could use any extra competitor to make this happen! 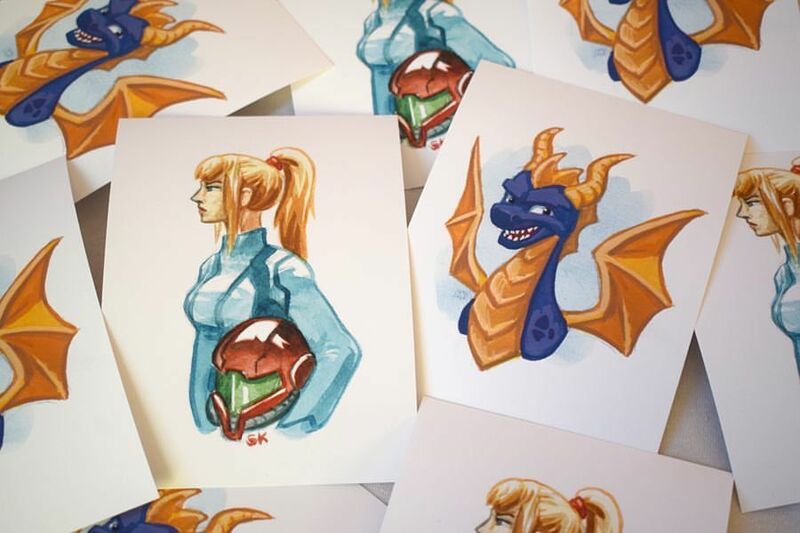 Oh, and last but not least: I finally had some prints made of The Purple Dragon and Samus Aran! They're A6 size, send me a note if you're interested! Last weekend my friend and I tried selling stuff at another con! The con itself was fun, though saleswise... it didn't went as good. I actually made a loss at this con: I sold only one print and a few buttons. I do think I know why this happened, though. Firstly, almost all the things I sell are Zelda themed, and after talking with other artists, Zelda things just didn't sell that well on this con. Perhaps there were just less people visiting this con who would like to have Zelda merchandise? It's a thing I can't control so I shouldn't blame myself too much for it.. Except I better have not only Zelda prints with me next time! Another thing is the fact that my friend had actually printed quite some extra A5 and A3 prints for this con. I didn't print anything extra as I still had so much stock from last con. Why spend another 50-60 euros on printing when I still have so much left? But that meant that there was more art of my friend on our table than there was mine. So perhaps we were unknowingly competing with each other for the attention of potential customers? Ultimately my friend sold wayyy more prints of her work than I did, and actually made a good profit. This could be just because she sold quite some Overwatch fanart which was wildly popular during this con, and probably too because she offered prints in smaller sizes than just A2. A2 prints are maybe a little daunting for people to buy, they're not really cheap and quite big, people might not have the space for such a print? Or maybe I'm just too inpatient, I mean: this is my second convention as a dealer and I already expect to make money out of this. If you're interested in what I exactly sold, I still have all the items I listed in this journal. And France did indeed inspire me! Though the things I've drawn there have to wait, as I don't have access to a scanner yet. But don't worry, there's digital art to come too! After some thinking I decided to give CenturyARkStorm-OCT a shot, but as a spectator rather than a competitor. I don't think it would be wise to combine something as time-consuming as a original character tournament with graduating from art school! XD Nevertheless I'm very exited where the story will take us! I didn't know anything about Zoids before Ra-ooo started this OCT, but as soon I found out it included robot dinosaurs I was sold! Then there is Comic Con Amsterdam, where I'll have a stand with two friends. I plan to draw a few new things for that, but not too much. I still have plenty of prints left from my previous con left anyway! Let's conclude this journal with some holiday pictures! Ever since my summer break has begun three weeks ago, I found it surprisingly hard to start drawing for myself again. I'm not sure why, perhaps it was the fact I've worked so hard during my internship? Or that I now have time to do so much other things I never had the time to do before, such as playing games and reading? Or it might be the bloody heat that lingers in my room, even with open windows..
Is this the mysterious affection known under the name... art block? In other news, I'll be leaving for a three-week vacation to Normandy and Brittany, France tomorrow. Perhaps the sea breeze and the beautiful vistas will inspire me to draw again! My internship at Abbey Games is over, what a blast it has been! I worked on so many different things: character animations, buildings, trees and shrubs, marketing illustrations, icons and even UI! Still, it'll take a while before I can show my glorious contribution, the soonest things will be revealed is in the first half of 2019. A little patience, my friends! I'm sad it's over, but I guess it's time to move on. I'll be enjoying my summer holidays now and in September I'll start working on my graduation project. Whatever my graduation project will be: I have no ideas yet. I'll just see what happens. And hopefully, now I have a lot of free time again, I get back on track with drawing and painting again! I saw Empoh doing this and why shouldn't I join her? Comment to be featured! I write a lil' something and pick three works I like. There are 10 spots available, first come first serve! The Supreme Overlord of Dreamy Backgrounds and Glowy Rim Light©. Her Birdyness, Empress of Soviet Aesthetics and Harbinger of Peace and Love in the Name of Eurovision. Also wannabe Estonian and best comrade in the world. Huge ZeLink fan! Love your black and white zelda drawings, the compositions are beautiful! Your kind comments always bring a smile to my face. Bryony draws wonderful illustrations of nature and animals. Your anxiety creature is a personal favorite of mine! She is also working on an project about epilepsy which sounds promising! 4. 5. 6. 7. 8. 9. & 10. Is still available! A2 prints of Sidon, Midna / Wolf Link and the Armos illustration I made! My phone is there for scale (not sure if it helps though). Postcards from Hyrule: Lake Kolomo, Lanayru Road (East Gate) and the Fairy Fountain. The little stamps were fun to design, even though they took a lot of time..
Small pins of Sidon, Midna and Morgana, 32 mm in diameter. I have only three left of these! The colours are a little light but the print is crisp! 10 euros and it's yours. Comment or note me if you're interested! All payments go though PayPall. This is already my second week of my internship at Abbey Games, and it's really fun so far! I am now working on animations for a new game, but of course I'm not allowed to tell you anything about it. Non Disclosure Agreements and stuff. But then I looked on the calendar and noticed that the convention that my friends and I want to attend is only three weeks away... And I haven’t finished a single piece yet. Oops. Even though this thing seems to move more and more to tumblr each year, I still wanted to close #rodyaweek in a celebratory matter here on DeviantArt too. This year actually marks the tenth anniversary of this tiny yearly celebration, which was prolonged to the end of January, yay! Five days late! Last year it was three, let's not make this a tradition. 2017 has been quite a special year for me. Even though I still study Illustration on paper, I haven't gotten a single illustration class last year. Realising that makes me feel a little nostalgic, as our class isn't together anymore and everybody is doing their own things now. I spend almost 5 months abroad studying animation at UMPRUM in Prague, Czech republic. It has been a wonderful experience and although I might not have learned as much about animation as I wanted to, I've made friends from all over the world and I feel I've grown as a person! Being in a different environment made me reflect a lot on what I like and what influenced me as an artist, resulting in FINALLY doing the Influence Meme. That monster was in the works for at least four years! I kind of wanted to make up for that by joining Draw Everything June. Which made me hurt my wrist again. I learned that the pain in my wrist actually wasn't carpal tunnel, but actually golfer's elbow. O.o I'm taking breaks from my pc every half an hour and do regular stretches. There is improvement, but it isn't gone yet. In September I started my minor Game Design and Development and it has been a true delight working on two real video games! Of course there were also some hardships to overcome during this, but what's life without them, isn't it? For our second and biggest game project, Aurora Trail, I've been learning to create 3D objects in Blender. Guess what? It's actually super fun! The modelling part is, I gotta say, strangely texturing isn't as much fun as creating the object itself. I really want to try incorporating 3D elements in future illustrations. For the first time in three years I have made up new original characters: harpies! I should go and give them a proper reference sheet as soon their designs are more or less settled..
2017 was my third year joining Inktober, but I didn't manage to finish it. I feel it might had to do with the fact I was trying to challenge myself too hard: I wanted to follow the official prompt list, tell a story with my new harpy characters and do all the drawings in the same toned paper sketchbook.. It might've been a bit too much. After quite some searching I'm accepted for an intern position at a game studio! Starting the first of February I will create characters and animations for Abbey Games. I'm excited for what this new year will bring! Two friends and I are trying to join an convention for the first time! If we know more I'll tell you, but for now you can expect more fan art coming your way, haha! And 2018 will also be the year of my graduation, if everything goes according to plan! I wish you all the best for the next 360 days! Do you have any special plans too? "I'll keep you informed on the progress." That was almost two months ago. Oops. Of course I should have written something earlier, but all of my energy went into creating the concept art, illustrations and 3D models for this game, as well as applying for internships, my new job and on top of that the usual December festivities ... I didn't have much energy left for dA. But now I have one thing less to worry about: I secured an internship position at a small game studio, whoo! I'll get to my messages soon, too..
First of all, I'd like to thank everyone who has downloaded and played our game, Wake! We passed the project with a very good mark and we even made it to 280 downloads! We immediately started to work on the bigger project with different people. Today we got our first feedback on a prototype we build in minecraft and of course still lots of things need to be done. The exact setting is still to be discussed, but the core of our concept is that you play together with a group of 4-5 people, while one of you is basically a mole who has to prevent the others from reaching their goal (which is still to be decided). I'll keep you informed on the progress. And then there is Inktober. I'm still days behind, in spite my efforts trying to catching up a last week during holidays. XD I hope I can manage to keep up at least this weekend, I really wanted to finish Inktober before November begins! On a sidenote, a group of classmates and I are joining a big exposition called the 'Kunstroute' in Alphen a/d Rijn (Netherlands)! So if anyone is near or in Alphen on 4, 5 or 6 November, go check it out! I will be presenting a bunch of Inktober drawings. Tomorrow Inktober is starting again and I'm super excited! This year I've decided to use the daily drawings to play around with story ideas for the harpy characters I came up this summer. Yes, the one winged harpy isn't alone anymore: I have ideas for at least five other characters and a vague plot line! I'm not giving away any more, but I shall provide enough context with every Inktober drawing so you can slowly getting to know these new characters and their quirks. For now can tell you that Ms. one-wing has gotten a name, Jurmala, and she loves to put on pranks! In other news, the game project is slowly getting on it's end. Next Wednesday we'll having a presentation where the game has to be basically finished. If any game-breaking bugs appear we have till Monday 9th to fix them and finish all the paperwork! After that, we move on to our next project (a 3D game)! 3. Tag 8 other people. I basically ditched Virha'qi together with Flip and their whole world when I went to art school (the drawing is from 2014). The reason for that was that it didn't feel right anymore to work on my headworld when I was studying there. I felt like all the things I thought up around Virha'qi and Flip were childish and I should make 'real' illustrations and projects now - 'artsy' things. But, without further ado, eight facts about this bad girl. Virha'qi is in her twenties for human standards. Her species are called Aroarian and are the last to live a nomadic lifestyle of all 'sapient' species of her world, making them discriminated and shoved off as dumb and primitive. In the original story, Flip would live with her working as a shop assistant in Virha'qi's weapon shop. This will probably change, but whatever direction I will be taking, Flip will still live with her. Gets a bad temper easily. Beserk buttons: jokes about Aroarians / females. Can't cook very well. Luckily there is Masterchef Flip. I also started working on a completely new story so even though I said I would dig this all up and redesign, I might not in the near future, so to say... Sorry! And anyone who likes to introduce their character. [x] Sunlight makes you feel happy. [/] You love all animals. You feel bad when you kill a bug. You own lots of plants. You are a very grounded person. You are physically strong or big. [x] You eat a lot and love food. [/] You don't mind getting dirty. You have a lot of sass. You get angered easily, but calm down quickly. You get into a lot of fights. [/] You love spicy food. You don't express your emotions. You come across as cold or uncaring. You are thin or frail. [x] You don't mind the cold. I really prefer cold weather over hot weather. Let it snow! You find yourself with cold extremities. [x] You crack easily under pressure. You have way too much energy. People tell you to quiet down often. You play your music loud. [x] You are often happy. [x] You are mostly relaxed. You can hold your breath for a long time. [x] You often dream about flying. You tend to "wing it" a lot. [x] You love to look at the sky and daydream. You love to look fancy. You are musical/can play more than one instrument. You are a tech whiz. You don't care about what other people think of you. [x] You don't often go outside. People expect much of you. You find it easy to figure out how things work. [/] People look to you for advice. You find it hard to understand people with different opinions. [x] You don't understand people. People think you are "evil". [/] You love rock music. 'rock music' is a really broad term? You relate to antagonists more than protagonists. You prefer to spend time in the dark. You take naps during the day. You believe in ouija boards/tarot cards/other magic. You think mythical creatures are real. [x] You are a hoarder. Did I mention I need an extra bookcase? [x] You never get sick. I can't even remember the last time I got sick. People avoid you like the plague. You love gross or dark humor. You have some sort of disorder. I'm a water dragon! Woo! Apr 8, 2019 I'm still alive! Oct 28, 2018 Happy Birthday Czechoslovakia! Aug 17, 2018 I'm back from France! Jul 5, 2018 And that's that. Mar 31, 2018 Feature for feature! Feb 4, 2018 #Rodyaweek 2018 Wrapup! Oct 28, 2017 Life updates. Aug 13, 2017 Original Character Tag! Jul 15, 2017 I'm a Water Dragon!